Now that I can play these games with a real Atari 800 XL, I feel more confident in giving these little comments. So let's go. This is one of those cases where the glory of the eight-bitters really shines fully. The simple gameplay that still demands your full attention, the excessively amazing sound effects, the wonderful and colorful screen flashes, and even the good rendition of the "Rule, Britannia!" in the beginning really make this immediately a memorable experience. This game cannot really be faulted with wisdom - there are no real downsides whatsoever, generally speaking. Everything is well done, polished and beautiful - and the world of the game creates a deeper immersion than any modern movie can. Having played the Commodore 64-version a lot, coming to this Atari version, I of course noticed obvious differences. A few details are different, and comparison is inevitable. The houses are more colorful, variable and better-looking to my eyes in the C64 version. On the C64, the airplane also is drawn to the proper perspective, and as more detailed, bigger and higher resolution sprite, it looks better on the C64. 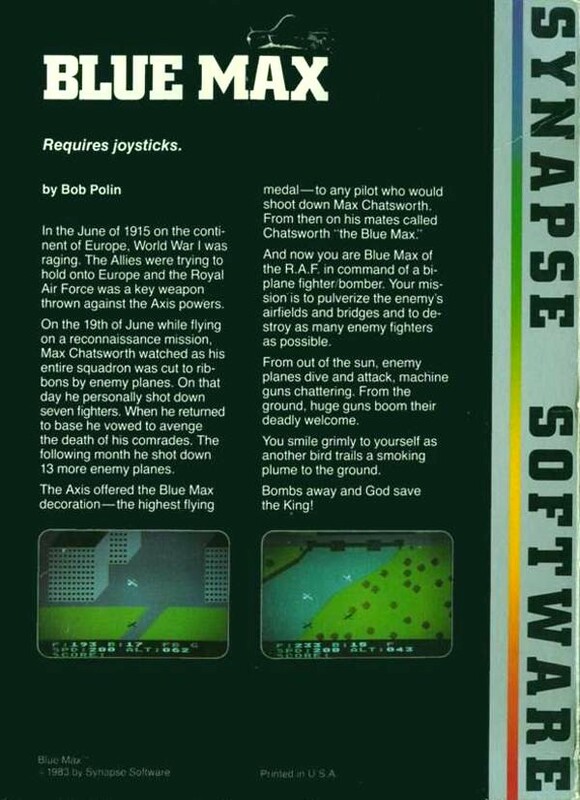 Same can be said about the airplane's bullets - on the Atari, it looks like the bullets are flying SIDEWAYS. It looks quite weird, and is hard to get used to. The C64's airplane sound is better, and varies more. The C64 version lacks some of the beeps and notice sounds that the Atari version has, though. The explosion sounds are different in both versions, but I have to say I prefer the really impacting, piercing and expressive Atari explosions that also properly flash the screen. On the C64, it's still all good, but on the Atari, an explosion just seems that much more of an EVENT, like something really happens! It's exciting and I can't get enough of that Atari noise wave. 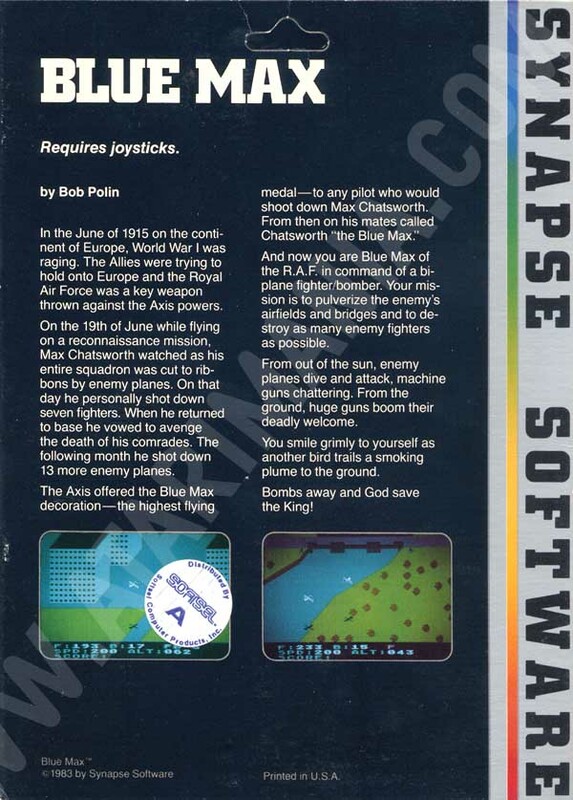 There is no title screen or intro in the Atari version, except a flashing "Blue Max" text right on the actual game screen. landing gear before landing. 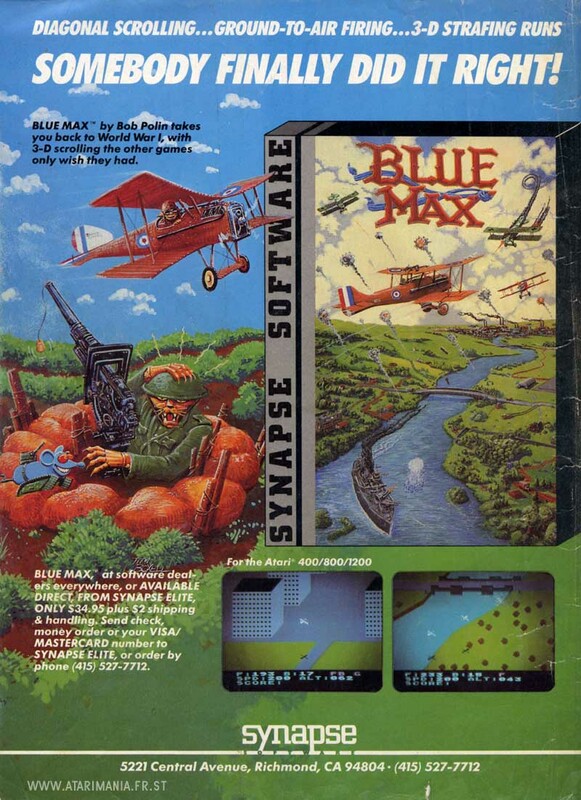 I'd say Blue Max as a game is a bit more tricky on the Atari side, but that could be because the gameplay is slightly different, and I have used to the C64 gameplay too much. Both versions are immensely enjoyable, and provide the player with different treasures. Atari's trees look bigger and better, but the graphics seem to be a bit lower in resolution, and a bit more grey and dark sometimes. I haven't completed the Atari version yet, so I can't do a -full- comparison, but I can still express my joy that I got from playing this magnificent Atari version. I think the versions are pretty much equal, because each one brings things to the player that the other version doesn't have. They are 'better than each other' in different ways. A great game in both platforms, I seriously recommend playing both on real machines. If you get ONE game for both platforms, if you get only ONE game to play on either of these eight-bitters to take with you on a deserted island, this should be one of the very top choices to select from. 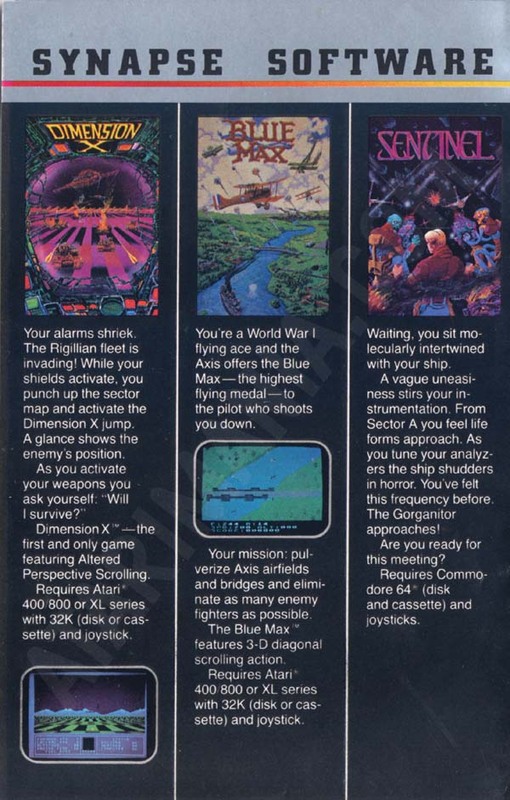 This diagonal-scrolling fighter plane shooter remains one of the finest games the 8-bit Atari ever saw. The whole thing is just so well designed, from the 'Rule Britannia' opening theme to the smooth scrolling graphics and addictive gameplay. A mixture of enemy planes and ground targets, and a raid on the enemy city for those who make it that far. I actually completed this game on the highest level once - perhaps my greatest moment of gaming? This game is also on my top ten list of greatest Atari 8-bit games. 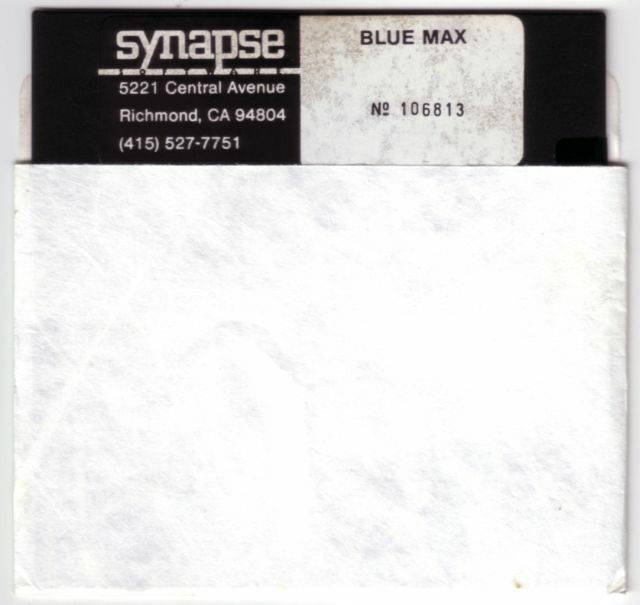 Synapse really cared about Atari computers. Polin took a Zaxxon concept, and made something quite original out of it. Top notch graphics & sound, smooth gameplay, and entertainment value makes this a winner all around. My favorite parts of the game is going into the inner cities and the final bombing runs. It took practice to get it done quickly and accurately! Like Star Raiders, I always wanted to play again to see if I could get a higher ranking. To date, my best is Blue Max, Class 3. This has to be one of the top ten greatest games on any platform in modern history! The graphics are functional and attractive, the sound is realistic and spot on, and the gameplay well. 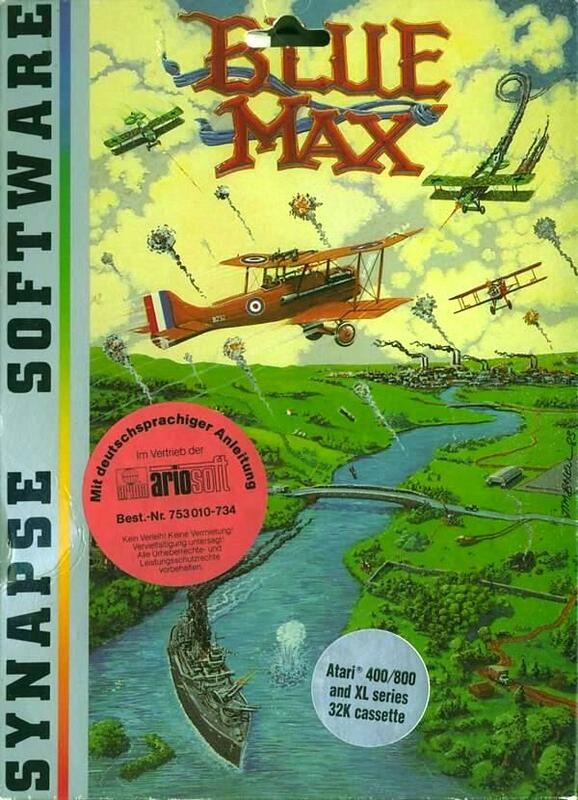 The gameplay is beautifully curved from mastering the altitude, shooting in coming planes and landing, through to reaching the city level. 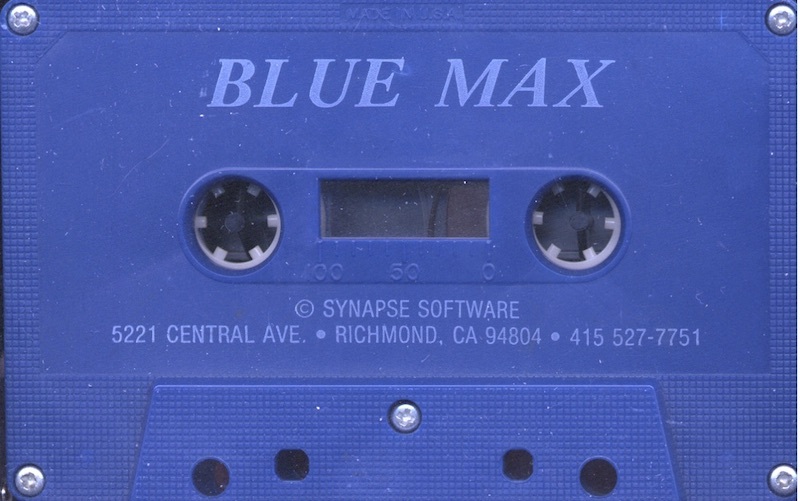 Gameplay is what it is all about and Blue Max is as perfect as they come. One of the best games on Atari! Great playability and fast shooter. The site is in Polish, but "Wersja instalacyjna" link is a download and game is in English. This is a beta release. 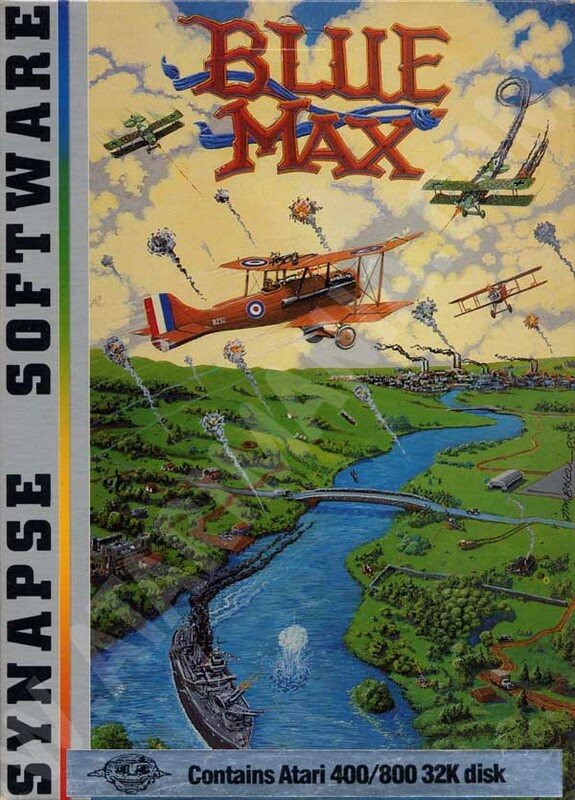 As with nearly every Synapse title, this one has extreme playability to the max. What a wonderful side-angle scroller. Far more fun to play than the Zaxxon translation, this little block graphics game really draws you in. However, it does take some practice with the stick, and gauging your altitude. I remember the first time I tried to take off, I pulled back on the stick and immediately crashed. Yikes, the stick is in REVERSE. Push forward to take off. Well, small complaint aside, the one is great fun, and well worth looking for on The Net. It's out there somewhere. I remember playing this game alot as a child (5 - 8 years old), it was one of the primary games I remember playing! I always found it difficult to land after I completed a level, which was frusterating to say the least. It wasn't exactly my favorite game, that was probably BoulderDash. This is an aerial combat game with more nice touches than the king's party crown. It proves that wartime flying is never easy but when played on a TV screen can at least be entertaining.